The Classic & Performance Car Spectacular, which is one of Britain’s most popular classic car shows, returns to Tatton Park again this summer, celebrating the golden age of motoring, from BMWs to Jaguars. We showcase loyal car clubs who exhibit their exceptional vehicles, and are always happy to talk about the experiences in the community and with restoring and maintaining their vehicles. Additionally, car lovers have the opportunity to exhibit their car for free at this years’ show. Over 2000 classics will be on display offering the public the chance to walk around and delve into the beauty of these spectacular cars. Our enthusiastic visitors display an impressive collection of privately owned cars from all over the world. The Show also features a massive autojumble with specialist suppliers and enthusiasts, alongside the car mart, which includes a great variety of general trade stalls. Whatever it is you need, we’re sure it can be found at Tatton Park – usually at a bargain price! Cars on show are entered into competitions across the weekend, where over 70 prestigious awards will be presented each day for various categories from the coveted best in show to the best club stand! 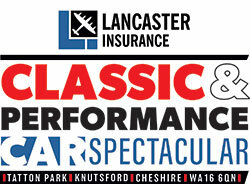 The Classic & Performance Car Spectacular takes place on June 1-2 2019, at Tatton Park, Knutsford, Cheshire, WA16 6QN. · Please note: All show exhibits must be pre-booked, don’t forget to download and submit an application form to display your car at this years’ show.